There is an extensive list of VPN services available in the market, but with the increasing need to protect our privacy from threats and to defeat censorship and blocks, there is still room for more solutions that fulfill the needs of customers around the world. FastestVPN is one of the latest providers to be launched in the VPN industry and in just a few months, it has managed to impress its growing customer-base with a service that is highly secure and incredibly fast. Fastest Technology Limited, the company behind FastestVPN has its home in the Cayman Islands and it is focused on security. Helping users to protect their privacy is a priority for the company, but as the name of its VPN solution suggests, there is also a strong commitment to deliver a fast service. Here, we’ll take a closer look at what FastestVPN has to offer. There is a wide variety of protocols supported, which gives users more flexibility to enjoy good performance and protection on different platforms. You can use OpenVPN (both UDP and TCP are supported), L2TP, IKEv2, OpenConnect, Xsec and PPTP. 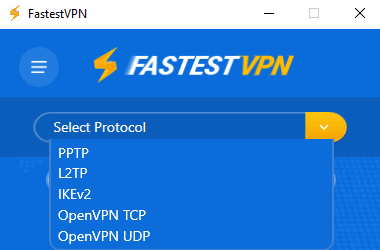 In the desktop VPN client, you can easily select the protocol and server that you want to use. To secure your data against possible threats, FastestVPN uses 256-bit AES encryption, which provides a high level of protection. When FastestVPN is running on your device, your entire traffic is protected so you won’t need to worry about intruders putting your privacy at risk. FastestVPN is a zero logging solution, meaning that it doesn’t keep records of your online activities, your IP address or payment method used. They only collect your name and email address when you register, but you can use an anonymous email address and select Bitcoin as your payment option. FastestVPN also promises not to share your data with third parties and even if the company is required to hand over data to law enforcement, since it doesn’t keep logs of your activities or connection, all the information that it could provide would be the email address and name used, but as previously mentioned, you can take steps to protect your anonymity when you register. The desktop software and mobile apps that FastestVPN offers for Mac, Windows, Android and iOS, are easy to use and make your experience with the service very convenient. You can also set up the VPN on a router and connect devices running a wider selection of platforms. The website includes setup guides that will allow you to install FastestVPN manually on Linux (Ubuntu) and other platforms supported. You can use the service in up to 5 devices at the same time. Since FastestVPN is designed with security in mind, it doesn’t come as a surprise to see that it offers a great list of features to protect your internet traffic. NAT Firewall is one of the security measures that are in place to protect your connection. It is enabled whenever you connect and it gives you end-to-end security to safeguard your data against threats like hacking and snooping. Unlike other VPNs that offer NAT Firewall as an add-on, FastestVPN includes it as part of the service for no extra cost, which is another good point for this provider. There is also malware protection available to prevent infections that could compromise your computer. The protection is activated once you connect and it is set to keep malware software at bay. In addition, there is an ad-blocking solution that prevents malicious ads from spoiling your browsing experience. You can visit your favorite websites without worrying about being tracked or spammed by annoying ads. FastestVPN also offers an extensive selection of IP addresses that allow you to enjoy anonymity and bypass restrictions effectively. You can keep your identity protected by disguising your real IP address and will also be able to get around blocks so that you can access your favorite content. At the moment, there are over 60 servers available and they are located in different regions around the world. 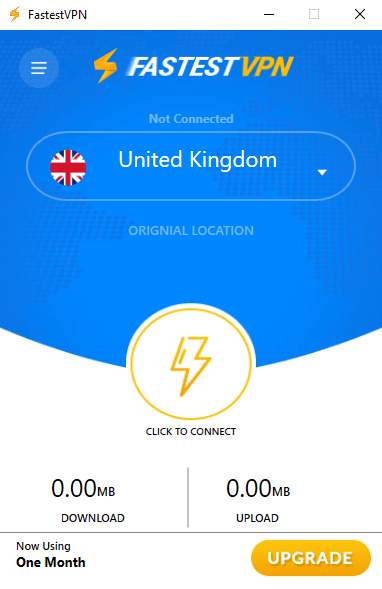 You can connect to servers in 13 countries including United States, China, Australia, United Kingdom, Romania, Germany and Hong Kong. Although the list of countries is limited, FastestVPN is just growing and you can expect more options as their network is updated. One thing to highlight about their network is that it has dedicated physical servers that run on Open Source. Other providers have only virtual servers that are not very reliable, but thanks to FastestVPN’s UNIX based servers, you can enjoy fast data transfer. They also allow P2P and have servers that have been optimized for this purpose. With FastestVPN’s advanced technology, you can stream your favorite content without experiencing blocks and buffering issues. The speeds are really impressive and since FastestVPN offers unlimited bandwidth, you will be able to stream media content whenever you want. Overall, the features supported are fantastic, but we hope that they add solutions like kill switch in the near future, as this will increase the level of protection they offer. FastestVPN is not only a convenient solution that combines protection, speed and ease of use. It is also an affordable VPN that is ideal for those who want to discover how a VPN can improve their privacy and security, and help them to bypass restrictions. Currently, thanks to an amazing special promotion, you only pay $49.95 USD for three years, which means that the price per month is incredibly low:$1.38. This plan gives you the best value for money, but if you don’t want to commit for a long period of time, you can opt for the yearly plan which costs $44.95, meaning that the monthly cost is $3.74. For one month of FastestVPN, you pay $10 USD. Although there is no free trial available, FastestVPN offers a 7-day money-back guarantee. You can pay using credit cards, PayPal or Bitcoin. FastestVPN’s website offers a great deal of information about the service and you can also find a useful FAQ, as well as set up guides. Everything is available in the Support Center and Knowledge Base section. If you have any further questions or need dedicated assistance, you can contact FastestVPN via email or Live Chat. We tried the Live Chat and were pleasantly surprised by the friendly, effective and prompt response that we received. It is clear that FastestVPN understands that in order to attract customers and keep its existing users happy, offering high quality support is crucial. Competitive prices, great security features, excellent customer service and a zero logs policy are factors that allow FastestVPN to be considered as a VPN that is on its way to the top. There are a few things that we’d like to see added such as a kill switch and more servers, but given that the company is still fairly new (they only started operating in 2017), it is likely that they are working to offer these and other options. FastestVPN started on the right path and we are looking forward to see how they evolve.